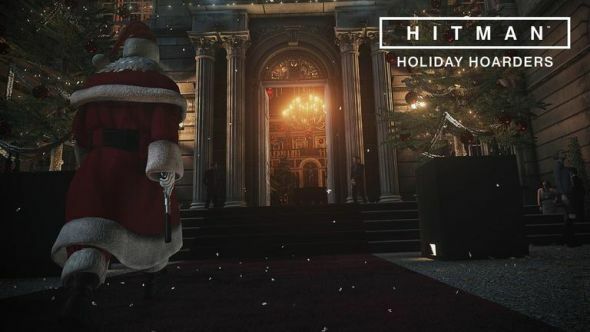 Hitman’s December update has now hit the game, adding the new mission ‘Holiday Hoarders’ and a few general tweaks to the game. Holiday Hoarders is a Christmas-themed reskin of the Paris map with new items and objectives. The update is released in partnership with the World Cancer Research Fund, and developers Io Interactive invite all players to consider making a donation in exchange for the update, which is free. There are two Hitman games on our list of the best stealth games on PC. The December update was released worldwide yesterday, so it’s available for you to download now if you haven’t already. You’ll need about 1.3GB of space. Holiday Hoarders gives a festive feeling to Paris, adding snow, decorations and a scattering of presents around the palace. Agent 47 can open these and use whatever he finds to help eliminate his targets; two thieves who have gained entrance to the fashion show. Added 3 holiday-themed items that can be obtained and used in the ‘Holiday Hoarders’ mission. Added a holiday-appropriate way to exit the ‘Holiday Hoarders’ mission. The release notes are available in fullhere. If you’d like to donate, head to the WCRF here. If you’ve yet to pick up Hitman, head toSteamfor all the sneaky assassination you can handle.